Raising your kids after divorce isn't easy. You constantly worry about how the split will affect them in the long run -- and let's face it, interacting with your ex in the name of co-parenting isn't always a walk in the park. Still, if you strive to put your kids first, divorce can absolutely be an opportunity to be a better parent than you were before your marriage ended. Last week, we asked our Twitter and Facebook followers to share with us what they believe is the best thing you can do for your kids after divorce. See 18 of our favorite responses below. 1. "Don't talk badly about the other parent. Modeling good behavior by getting along with your ex is really critical to the kids' stability. 2. "Be consistent in everything you do. Be dependable, reliable and make them laugh. Often." 3. "Remember this: Genetically, your kids are 50 percent your ex. Every negative thing you say about him or her, you're saying about the kids, too." 4. "Be honest with your kids in an age-appropriate way." 5. "This is a good time to be a smotherer. 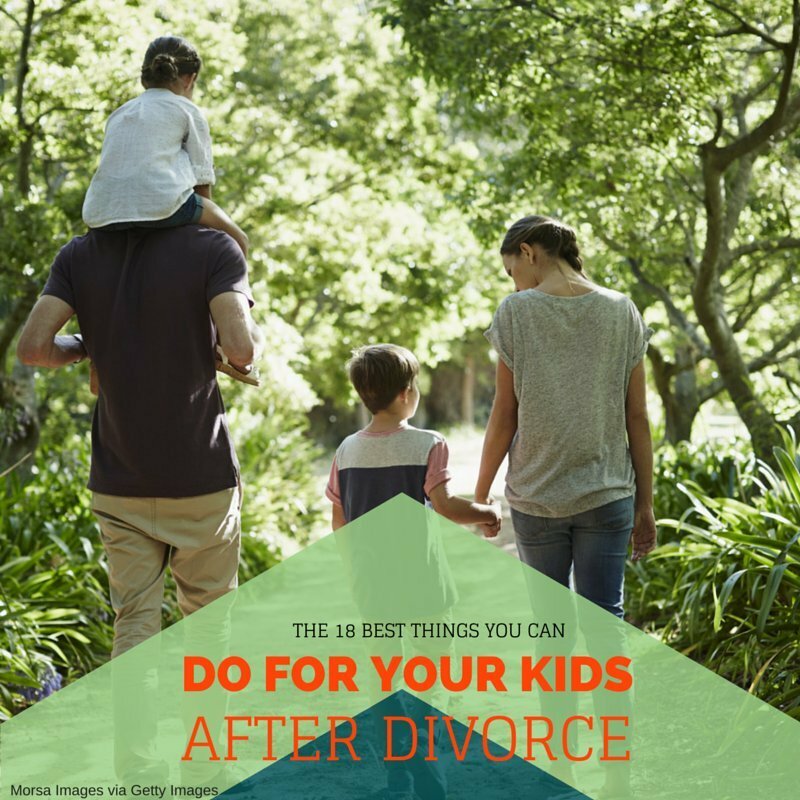 Smother them with love and support and remind them that the divorce has nothing to do with them and that ultimately, it will be for the best." 6. "Get a therapist for the kids during the divorce, not after. We did so and my kids really benefitted from having someone removed from the situation to talk to about their feelings. She encouraged them to open up and helped us sidestep a lot of serious issues." 8. "Understand that some situations don't lend themselves to co-parenting. Consider alternatives like parallel parenting. Just because you're divorced doesn't mean that your spouse has changed." 9. "Allow your kids equal time with both parents. They deserve it." 10. "Don't blindly follow advice from books on post-divorce parenting. The best way to comfort your kids is to go off what you're sensing from them, not what some self-help author told you to do." 11. "Be empathetic about the grief they are experiencing. Encourage them to talk and don't judge their feelings." 12. "Put their needs first, even before your own. Everything you do should be done in their best interest and nothing you do should be done without asking how your choices will affect them." 13. "Try your hardest to co-parent. Be there for your ex so you two can support your kids as a team. It's no longer about the adults so put any animosity aside and do what is in the best interest of your children." 14. "Realize how futile it is to trash-talk your ex sooner rather than later. The kids will determine the merits and minuses of each parent on their own." 15. "If you're allowing the kids to choose who they live with, don't make them feel guilty about their choice." 16. "Keep in mind: They're the innocent victims in the situation. Treat them accordingly." 17. "Never use your kids as a weapon, a go-between or a spy against your ex. And never talk negatively about the other parent near them or anywhere they can hear or see it (hint hint: Facebook)." 18. "Love your kids more than you hate your ex."